(Nanowerk News) Levitation techniques are no longer confined to the laboratory thanks to University of Bristol engineers who have developed an easier way for suspending matter in mid-air by developing a 3D-printed acoustic levitator. This new technique, published in Review of Scientific Instruments ("TinyLev: A multi-emitter single-axis acoustic levitator"), could be applied to a range of applications, including blood tests. Anyone who has felt their chest vibrating with the energy of the soundwaves at a festival is already familiar with the principle behind acoustic levitation. 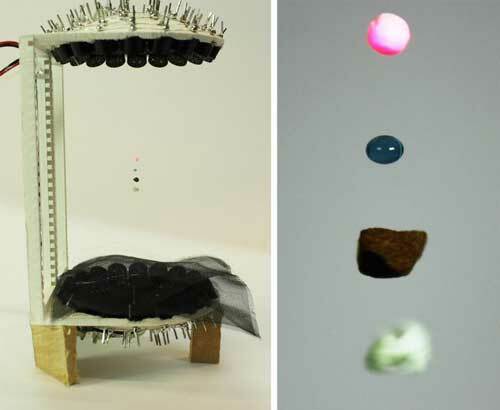 Acoustic levitation uses powerful acoustic waves to push particles from all directions and trap them in mid-air. By using ultrasound - a high-pitched sound above human hearing - it is possible to use powerful vibrations without causing any harm to humans. Magnetic levitation uses magnetic fields to suspend objects in mid-air. Acoustic levitation is not as strong as magnetic levitation but it can act on a wide range of materials, from liquids to living animals. Using parking sensors, a motor driver, an Arduino (a single board microcontroller) and a 3D-printed part, the University of Bristol team has developed an instruction pack for those wanting to assemble their own levitator at home or school. The instructions will enable any researcher to put together a levitator and conduct experiments in acoustic levitation. This levitator is safe to use, robust against temperature or humidity changes, and can operate for extensive periods of time, enabling experiments that were not possible before. Dr. Asier Marzo from the University of Bristol's Department of Mechanical Engineering, explains: "Levitating samples in mid-air can improve diagnosis from blood samples and detection of the structure of molecules. Usually a sample on a microscope slide is illuminated with x-rays, lasers or another type of radiation so the reflected radiation can be analysed. However, no matter how transparent the microscope slide is, it will always interfere with the test. On the contrary, if the sample is levitated, all the reflections are going to be from the sample. "Acoustic levitation has been explored in hundreds of studies for applications in pharmaceuticals, biology or biomaterials. It holds the promise of supporting innovative and ground-breaking processes. However, historically levitators have been restricted to a small number of research labs because they needed to be custom-made, carefully tuned and required high-voltage. Now, not only scientists but also students can build their own levitator at home or school to experiment and try new applications of acoustic levitation."